I was exiled from the living room the other day because Jack and Jackson were in the midst of a Game of Thrones marathon, so I sat at my little desk in the kitchen and copied the bear from a bookmark* I'd found at work. 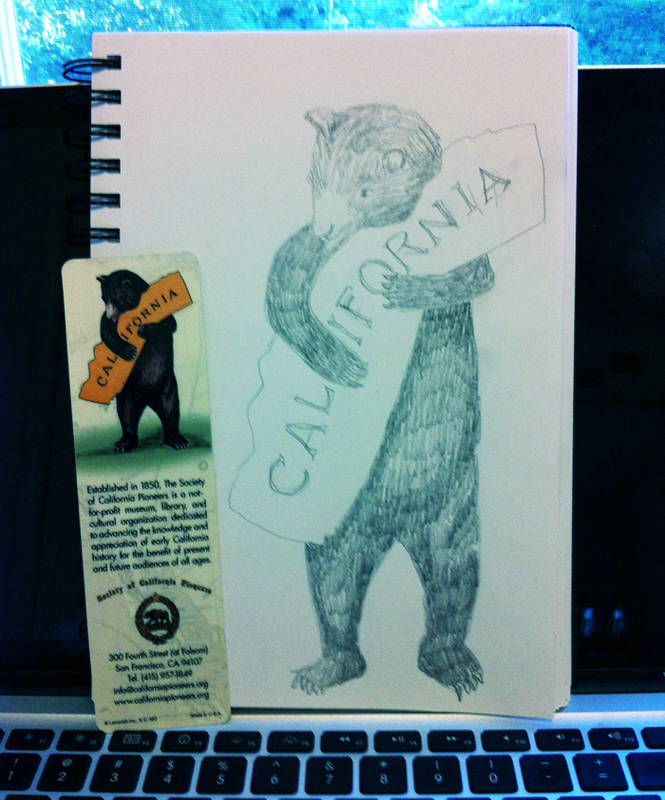 Someone suggested that this is how California got its shape, a bear hugged it so hard that it bent. This is a plausible mythology, and I like it. I also like how the bear is licking its own fur because it seems like Bear Behavior to lick yourself for a few moments between the time you capture something and the time that you eat it. Like, a bear needs to settle itself down a little before digging in and consuming your heart and lungs. The bear loves you so much it eats your heart first. "California, I've got you!" growls the bear, and the bear has a whisper of love in its voice. The bear wants you inside where you can be a part of the bear and never get away. *People leave bookmarks in library books all the time. We frequently find family photos, greeting cards (both blank and used), playing cards, Kleenex, fast-food napkins, Post-its, boarding passes, tarot cards, and actual bookmarks. We call the people who leave the photos, then we throw out the trash and put the actual bookmarks in a drawer so that when people say, "Do you have any bookmarks?" we can fan out a splendid array of miscellany.